I think that Soda bread is often overlooked, considered the poor relation, not 'proper' bread. It is so easy to make and perfect for when you want fresh bread but don't have the time or inclination to spend hours in advance preparing and baking! 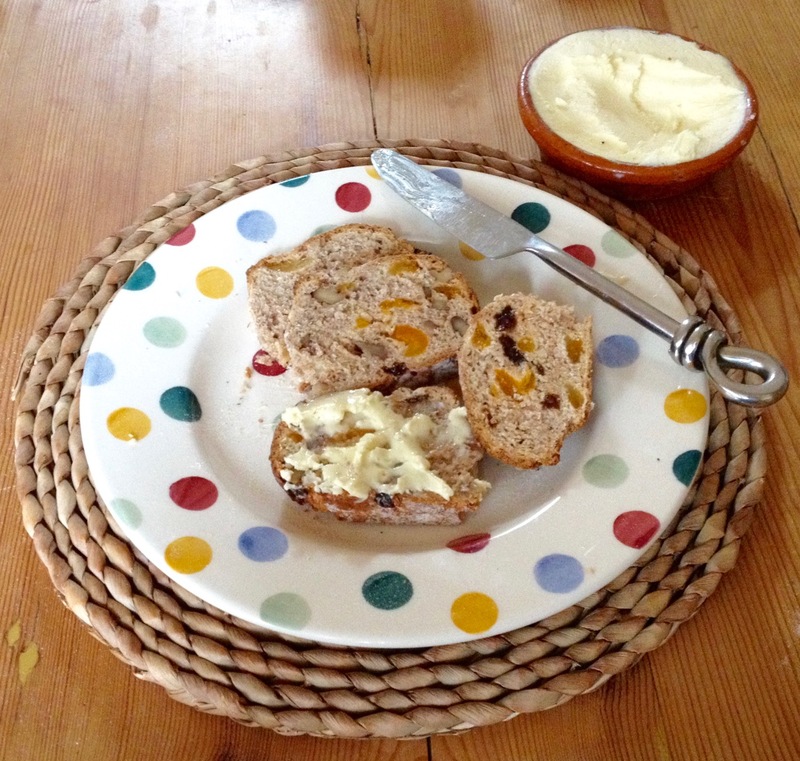 We often have Soda bread for breakfast but it can so easily be modified and flavoured to suit the time of day........ plain.....sweet......savoury etc. Check you have all the ingredients to hand and ready to work with, once you have added the buttermilk to the dry mix, time is of the essence! Be quick and efficient with the mixing and shaping and get the dough into the oven as soon as possible. 200g Wholemeal flour (I like a mix of 100g extra course wholemeal and 100g wholemeal Spelt). If you prefer a lighter style then use 100g Spelt and 100g plain white flour. 160g Buttermilk ................. (can go to about 180g if buttermilk is a bit 'thick') Note: Kefir will produce similar results, or if you want to go really 'upmarket' then try 120g creme fraiche with 40g milk. Mix the dry ingredients in a large bowl then when the oven is ready add the liquid to the dry ingredients and mix thoroughly with a plastic knife or paddle until you have a nice integrated ball of slightly sticky dough (don't take more than a couple of minutes or so, as the baking powder will have started to react). Flatten the ball into a round about 3 cm thick (I do this on a sheet of baking parchment on a lipless tray to make it easier to place in the oven) , lightly dust with flour and then press a cross through almost to the base but not quite (use a bread scraper or spatula). Bake in the oven for 20 mins or so then remove and test that it is fully cooked either by tapping the base and hearing a hollow sound or probe with a digital thermometer and if above 95c then good to go! I agree that soda breads are underrated. There are endless combinations of ingredients so everyone can find a favorite-from sweet to savory. Another under-rated bread category is batter breads. These are yeasted doughs that mix up almost like a cake batter, rise once in the pan and bake. Much quicker than kneaded bread and if made with a smaller amount of yeast, can have quite a delicious fermented flavor. It does take a little longer than the soda bread but not much. I learned about them when I had hand surgery and couldn't knead or handle a dough much. If I tilted the bowl on the counter, it would pour into my pan. Oh my goodness, that looks so good! And one of the nice things about soda bread is that you can enjoy it warm out of the oven. There are so many good kinds of bread. I guess that's what keeps this forum going - always something new (or old) to try! How's your soda bread do over time? 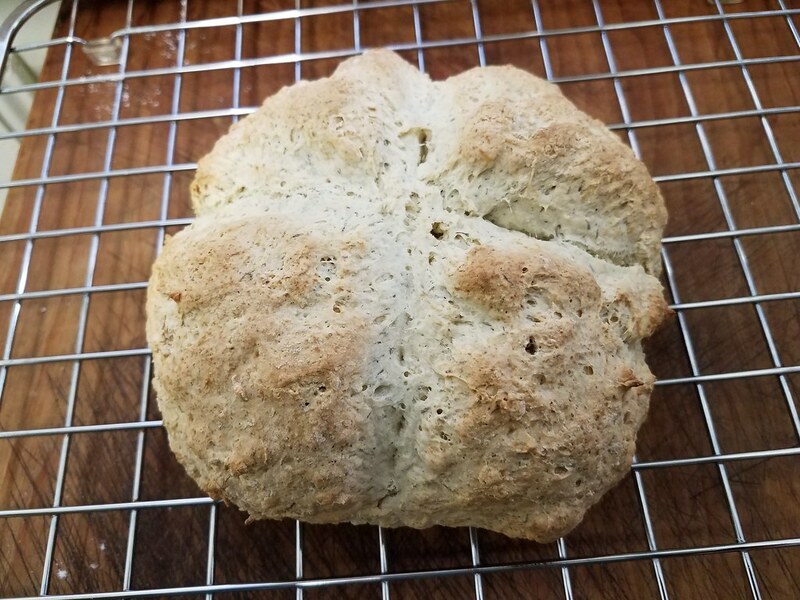 Chockswahay - I know soda bread is great right out of the oven, but how long does it go before the quality is too low to eat it? I know baguettes lose their peak pretty quickly - how about your soda bread? 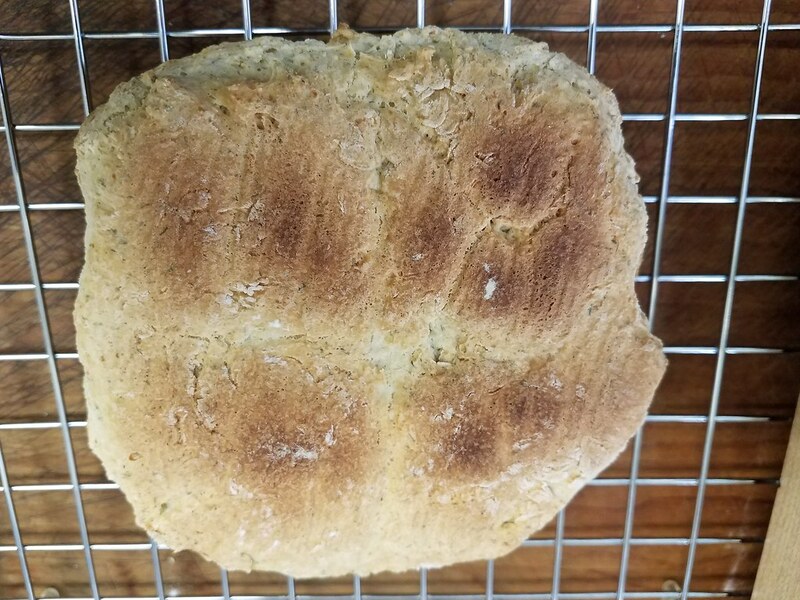 Thanks for sharing the formula & photos - I may try some myself after a long hiatus from quick breads. i just did two versions of this bread - a whole spelt loaf and a white spelt loaf. both rose beautifully, both ended up nice and bready. the whole spelt version was easy and fast, the white spelt version was very sticky dough that worked better when hands were lightly floured. a little salty for my taste, i'm going to try another loaf with 3 grams salt instead of five, and unless the salt is needed to retard the rise like with yeast bread, i think it'll be abso perfect for me. after that i'm going to try a loaf with anaheim or hatch chilis. Glad to see you're still at it! I am not a nutritionist, but I seriously doubt a soda bread can be as healthy as a fermented bread. 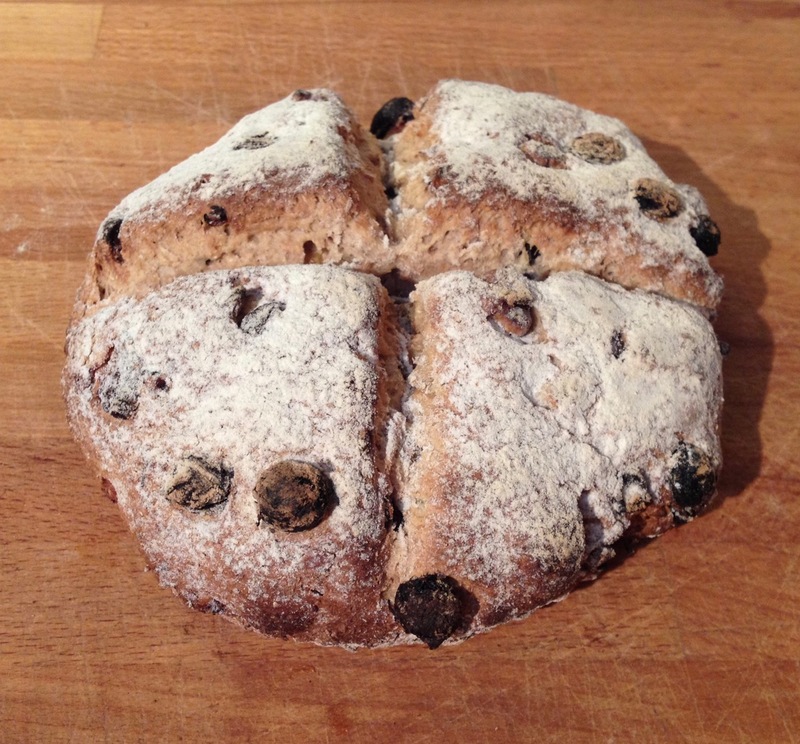 I have tasted Spelt soda bread in Ireland. I couldn't finish one slice. but you haven't tasted THIS soda bread, which isn't exactly soda bread as it uses baking powder. it's delicious, and i've found several variations that are also delish! the amount of salt can make a huge difference in taste, and i found that if the buttermilk is room temperature, it makes a big difference. also i make more white spelt than whole grain because i prefer the taste, although white spelt is stickier in dough and needs less liquid. and if you like dill or fruit, this is a super easy bread to add it to! i wonder if there's a way to ferment some of it... i soaked my dill in buttermilk - perhaps some of the flour could be fermented with the buttermilk while the rest would be mixed with the salt and baking powder. I just started my annual spring Chive Blossom Bread and thought it would be a GREAT flavor for a soda bread, also. 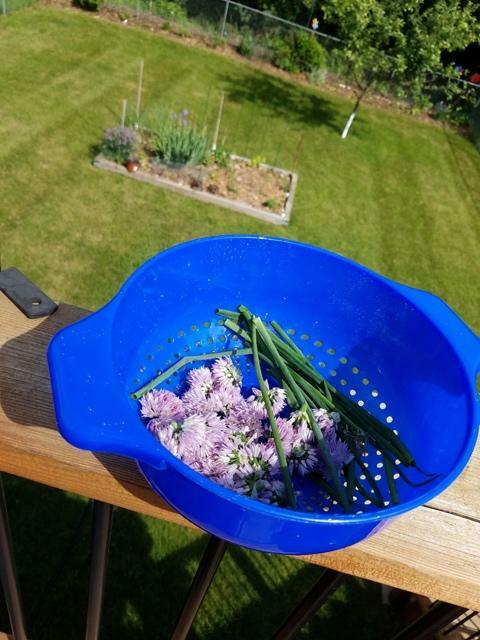 Just snip the opened chive flowers, rinse them off and then pull the petals off the hard stem. Add the lovely purple flowers and some sniffed leaves to your dough to evenly incorporate. Should be delicious! and i've never tasted them, either. are they lightly oniony or ? The chive plant is visible on the left side of the garden. The colander has freshly harvested blossoms and a few leaves. Chives are easily grown in pots,also. They bloom every spring. Harvest the leaves and snip into salads,potaotes,pasta,rice,pancakes, or almost anything for a mild oniony flavor. Garlic chives have a slight garlic flavor.The flowers also have a mild oniony flavor. instead of using buttermilk, i used trader joe's icelandic style yogurt with enough water to thin it to a buttermilk consistency. i wanted to use siggi's, but the store was out, and the tjoe's version did a great job. the loaf tasted like sourdough, and with butter it was divine. i'll be making this one again SOON! 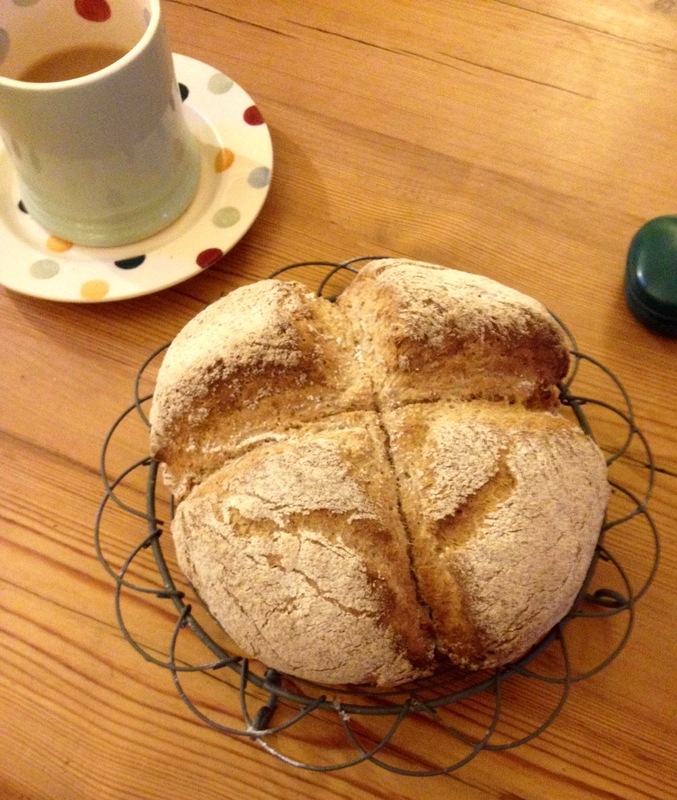 I am still baking Soda Bread almost everyday for our breakfast. I have this morning altered the original recipe notes on the thread to reflect this. The current quantities/ratio should eliminate the occasional bitter/soda taste that can occur. i can't find a link here to the thread. i never get a bitter taste and i've made at least 50 of these soda breads.